I started watching the Live Tracker for the Iditarod Trail Invitational at 2pm on Sunday and I am so excited for everyone finishing and participating. What a cool event! It entirely blows my mind that some folks are out there who have done other winter ultras this season. 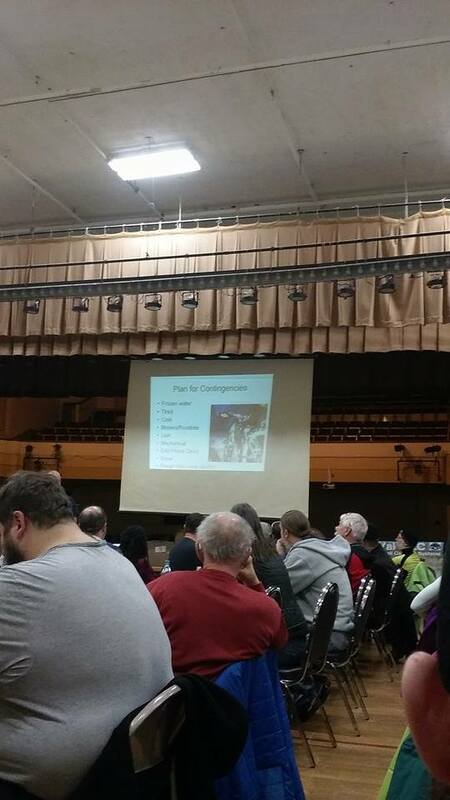 I cannot wait to hear their stories and to pick their brains once they've finishing the Iditarod! I'm full aware that the human body can do amazing things, but I want to know how their body fares after pushing it race after race and still getting out there and getting it done. It's awesome. It's inspiring. It makes me want to keep pushing and working towards being able to do what they do. The Arrowhead 135 was over a month ago and I’m just now starting to feel back to normal. 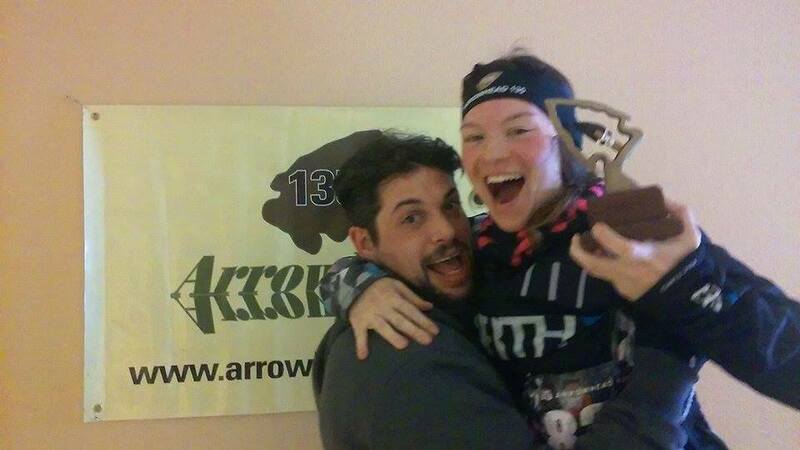 I did a race a few days after the Arrowhead (the Iron Line) and felt really good. Three weeks after the Arrowhead I did another race (Fatbike Frozen Forty) and I felt like I had just gotten off of a 100-mile ride. 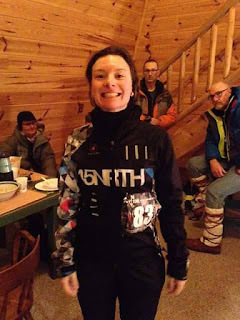 This past weekend I raced again (906 Polar Roll) and I felt nearly back to normal, still fatigued, but in way better spirits. 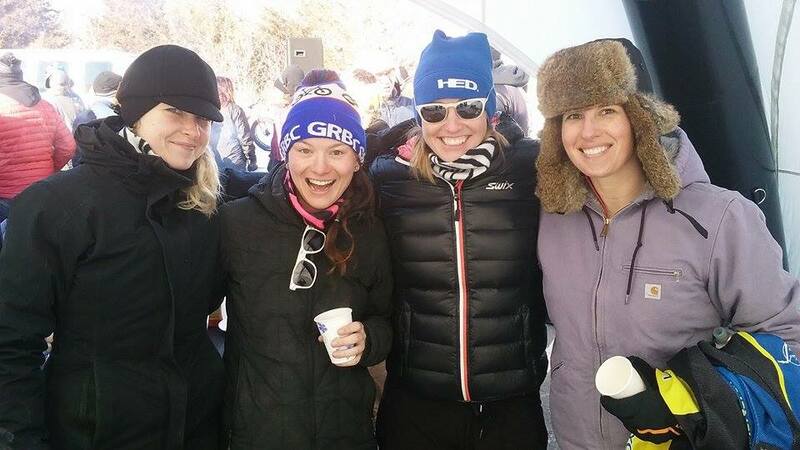 The common theme to all three of these races has been “Perseverance.” I know it takes time to heal after doing a long race like the Arrowhead but I wouldn’t trade the experiences of the Iron Line, the Frozen Forty, or the 906 Polar Roll for anything in the world. I love the racing, the people I meet, the women I get to race with, and I feel like a kid in a candy store – stuffing my face with as much as I possibly can because it’s awesome and I love it and I can’t help myself! 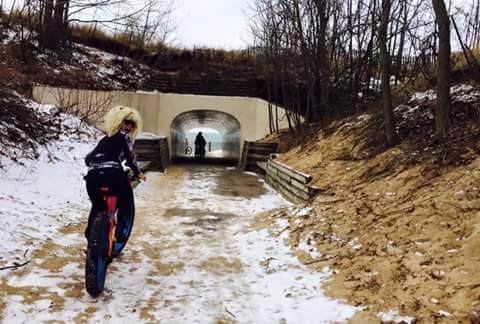 This is my third year participating in the Great Lakes Fat Bike Series and I couldn't miss out! The GLFBS races are just TOO MUCH FUN! The Iron Line in Iron River, Michigan. Myself, April Morgan, Chelsea Strate. 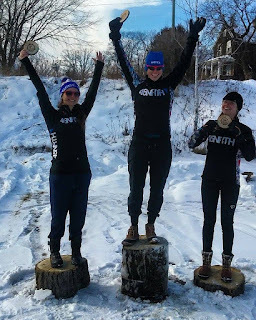 These ladies killed it at the Fat Bike Frozen 40 - I, however, did not. 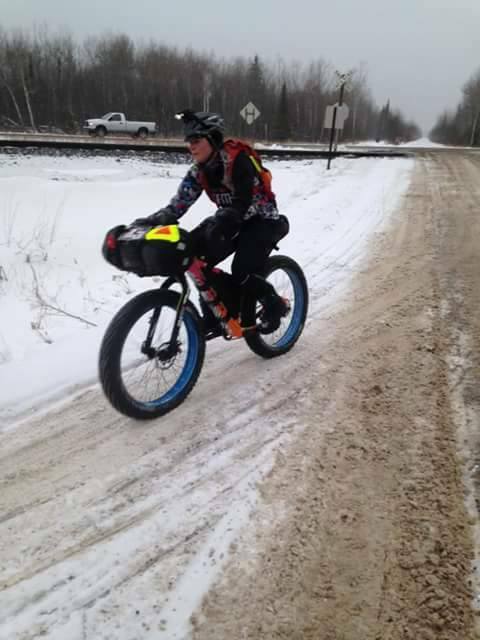 906 Polar Roll threw really mushy conditions at us. 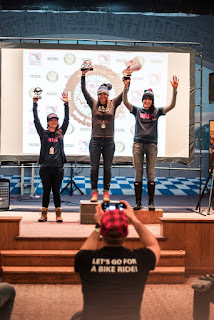 So happy to share the podium with April Morgan and Danielle Musto! Dan drove with me to the Arrowhead 135. As a surprise, he rented a jeep with AWD, so we didn’t roll the vehicle on the way home like we did after the Tuscobia 150 last year (very thoughtful, Dan!) I know I thank him all of the time but I cannot thank him enough! This guy got me a set of Paul Love levers to use with mechanical BB7’s because he thought they'd work best for me out in the cold (better than roses) picked out which color aluminum HED wheels he thought I’d like best (he nailed it), built them up, built up a spare wheelset for me to use just in case I needed them, and when I decided I wanted to run the 45NRTH Vanhelga tires he helped me get them set up tubeless and he trusted my judgement, despite hearing that a lot of other Arrowhead racers were running the Dillingers (I am so happy I had the Vanhelgas!) Dan had me laughing as he used the luggage rack at the hotel in International Falls as a bike stand to run through my bike. 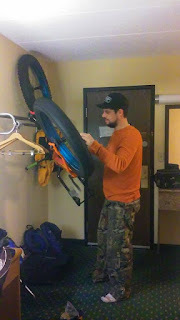 He’s a great mechanic and my bikes are always working well, and I think the final run through was to put his mind at ease more than my own; he worries about me when I go out on these grandiose adventures and wants to make sure I roll through the finish line in one piece. I’m really lucky to have his support and wouldn’t be able to race as much as I do without him! 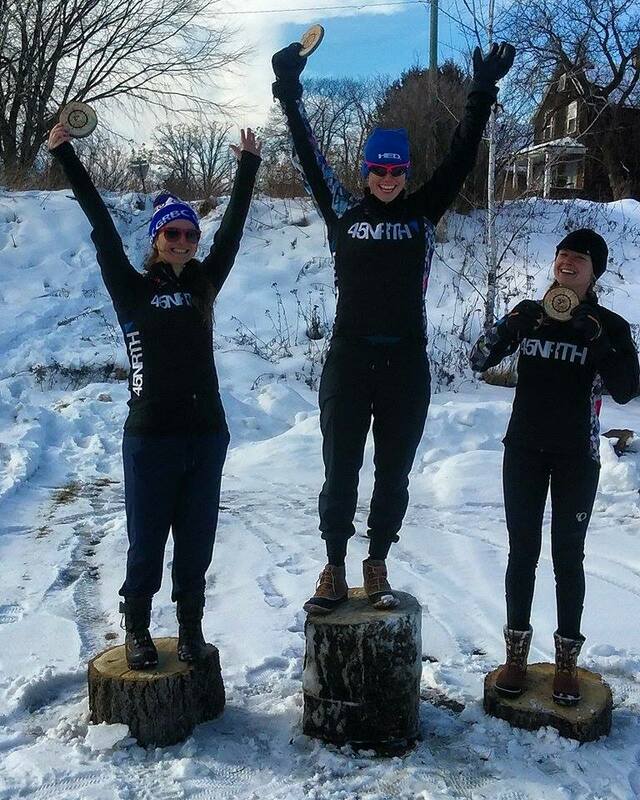 Knowing that everything is in tip top shape and not having to second-guess my own mechanical abilities at the start of a race gives me one less thing to worry about and I can spend my time obsessing about food that I want to eat, trying to decipher what type of animal left those footprints in the snow, and focusing on moving forward. The drive up to Minnesota was an adventure in itself! My minivan is from 2001 and the jeep had a leather interior, heated seats, a heated steering wheel, a rear-view camera to help with backing up, compartments hidden all over the place, and headlights that were a bazillion times brighter than my Pontiac Montana’s! Dan drove and I got to put my feet up and keep myself entertained by making fleece neck warmers for some friends. Like I do with a lot of other things, I turned it into a competition soon after driving out of town: how many fleece neck warmers can I make before the bridge? Well, I guess I was trying too damn hard and the universe decided to help me set a new world record: just as we drove up to Mackinac City we saw a billboard, “Bridge closed due to falling ice.” Whaaaaat?! We made a lot of jokes about how I had willed the bridge to close so that I could make all the neck warmers. We were sad that we might miss the pool at the hotel I had booked in Duluth, Minnesota. Then we realized we had forgotten to pack swimsuits. Being the opportunist that I am, I made a bikini and some swim trunks for Dan out of leftover fleece. The bridge was still closed. We played around a putt putt golf course that was closed and tried breaking icicles off of the side of a building with snowballs. Still closed. We went to the Keyhole Bar to grab some food and a beer and lo and behold – once we ordered, we heard a ruckus outside – people were running through the streets yelling, “the bridge is open!! !” We quickly grabbed the bill, slammed our beers, and took the food to go. It was like mass exodus leaving Mackinac City. Luckily we were able to hit the bridge before the long line of vehicles and we were again on our way. Side note: once we made it to Duluth the fleece swimsuits WERE NOT appropriate for public use. I won't quit my day job to be a swimwear designer. We made it to Duluth around midnight and were surprised to see so many people walking around town. Wait, were they high schoolers in floor-length gowns? I don’t know why a bunch of 17 year olds walking around without jackets was so funny, but Dan and I kept chuckling about it. I asked a group of kids if it was prom or something and they started snickering at us. Touché. I had been all excited because I had booked a fancy room at the Radisson downtown Duluth and I was looking forward to a bed made of clouds, a giant bath tub, and to a view of Lake Superior. Apparently I hadn’t noticed that I booked a room in “the tower” and there were no corners in the room which was weird, we had a view of the side of a building, the bathroom shower head screamed when you turned it on, and aside from the high school dance there was also a hockey tournament in town – we were sharing our floor with a bunch of drunk hockey players who were running around the circular hallway and leaving their plethora of candy bar wrappers and cases of empty red bull outside their room doors. What?! We got a solid night’s sleep anyways and headed to International Falls, Minnesota in the morning. 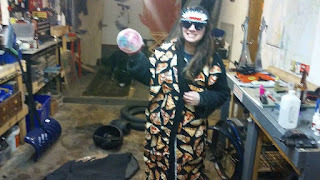 Candy, cool shades, even cooler pizza robe. Compliments of Jenny Scott before we left town. The drive was really pretty and I was getting really excited the closer and closer we got to our destination! We made it to gear check-in in record time and I was a little embarrassed to run to the car three times to grab required gear while volunteer’s checked off my checklist. 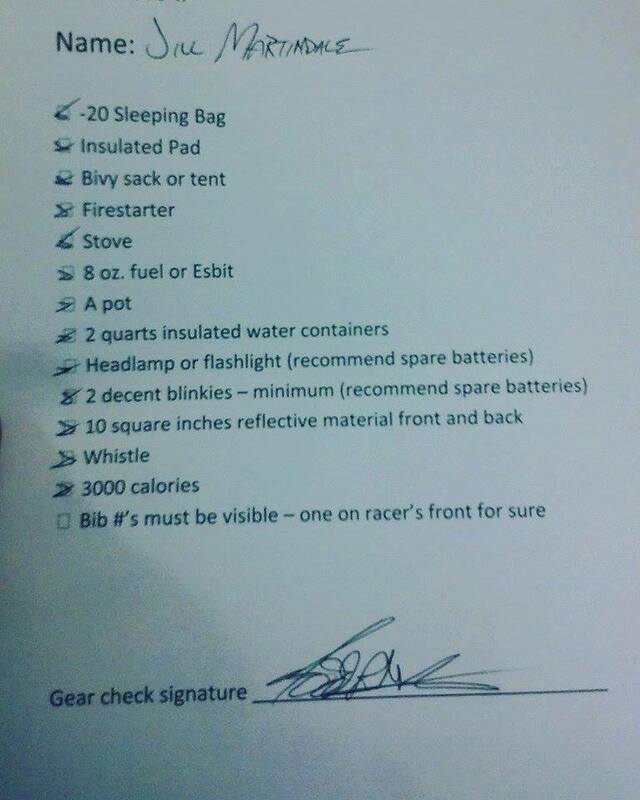 I didn’t pack my things smartly and had stuff thrown in bins and bags and had to rummage through everything in order to find the items on the list: headlights and a bazillion taillights, -20 degree sleeping bag (thanks for letting me borrow yours again, Dan Jansen! 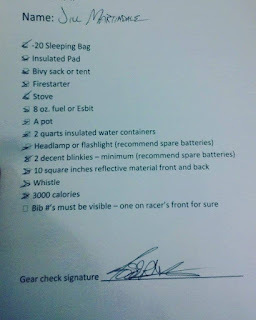 ), insulated sleeping pad, bivy, 3000 calories (a jar of hazelnut butter, some gels, and a snack bar), firestarter, stove (I usually take an MSR pocket rocket camping, but took an Esbit stove and fuel tablets to save on weight and space), insulated water container (Camelbak’s 100oz Gambler winter pack and an insulated 24oz bottle), reflective material (I used a sticker-like crazy reflective material that I stuck all over the front and back of my jacket, all over my Camelbak, and all over my bags and bike! ), and a whistle. I also had on way more batteries than necessary, extra base layers, headwear, gloves and socks, duct tape, a Joshua Tree winter-stick to smear all over my face, a glow-in-the-dark compass/thermometer, reflective triangles for the front and rear of my bike (seriously had so much reflective stuff I looked like a UFO), and a whole lot of ziplock bags. I had wanted to rent a Spot Tracker but had some weird issues with trying to rent one – I made a rookie mistake and didn’t rent one from Track Leaders, who would actually be at the race, but from a different company who had to mail the tracker to my house. I was excited to play around with it for a while before the Arrowhead and to go out on a few trial rides, but it actually never came. By time I realized I could rent one at the race it was too late and I didn’t get in my request in time. You’ll be happy to know that immediately after Arrowhead I managed to snag a Spot Tracker that I now own and will be able to use in the future. You live and you learn, right?! The whole drive I remained pretty chill, probably because I’ve been traveling to so many races recently that it felt normal. Once we got to gear check I started FREAKING OUT. It wasn’t nerves, it was sheer excitement! I was so stoked to be there! I wanted to take pictures of everything! (Total tourist.) I tried to play it cool but I wanted to say hello to everyone, thank the volunteers a million times, and gawk at the gear that everyone else brought. 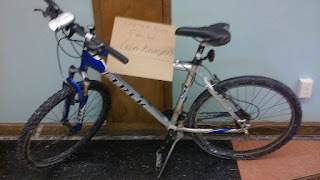 In one part of the room a 26” Trek was propped upright by a kickstand, with a knobby tire up front and a semi-slick in the rear and a department store headlight perched on its handlebars. 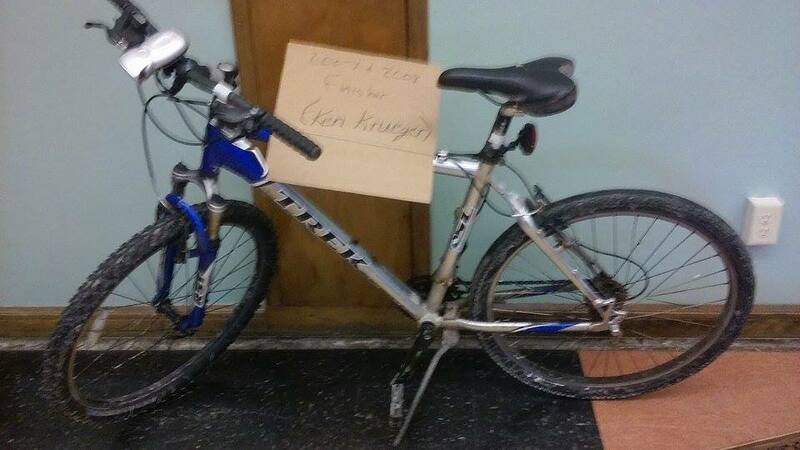 A handwritten note on a cardboard sign read, “2007 + 2008 Finisher (Ken Krueger)”. 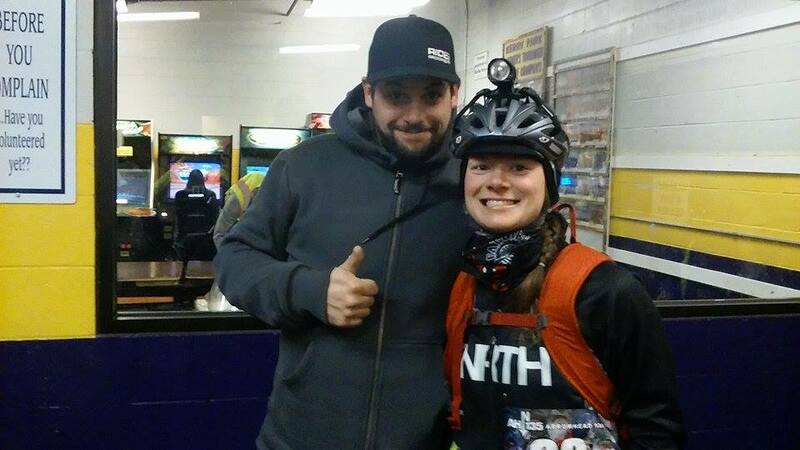 Talking to Ken’s wife, Jackie, I learned that Ken cut 20 hours off of his finish time just by getting a fat bike. That’s awesome and respectable in so many ways! Ken and Jackie now own the Arrowhead and do a fantastic job putting on this race. After gear check, there were a couple hours to kill so we checked in to the hotel and my stuff exploded all over the room. I could tell Dan was a little tired and wanted to lay down, but somehow I had accidentally managed to spread my gear over both of the double beds… and all over everything else. He sat in a chair and watched as I made tiny piles of things, combined piles, made more piles, and sealed things up in ziplock bags. 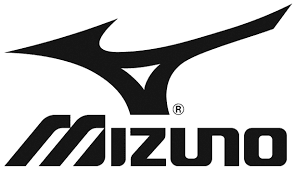 A pair of merino wool liners and socks in one bag. Headwear in another. Firestarter, emergency blanket, a first aid kit, and waterproof matches in one, snacks in another, extra batteries and a portable USB charger in one, a long sleeve wool base layer in another, and a spare pair of cycling shorts in the last one. I packed things on my bike in order of how likely I’d use something, putting the most important items in an easy to reach spot: sleeping bag got crammed inside of the bivy and got packed in a compression sack (with the 3000 calories I needed to finish with) on my handlebar bag. Sleeping pad got crammed in the bottom of my seat bag, followed by wool leggings, a pair of my Sturmfist 4’s, my pot (with the camp stove, esbit tabs, waterproof matches, tinfoil, and fire starter packed inside of that), and another wool long sleeve base layer got piled on top of that. The plan was to not even open these two things during the race, but I had everything I needed in case I decided to bivy up easily accessible so that I wouldn’t get cold while setting up camp. In my frame pack I put hand warmers, snacks, the ziplock bags full of extra headwear and gloves/socks, a pocket knife, emergency blanket/first aid bundle, and my insulated water bottle. If I was super cold and in a pinch I could wrap up in the emergency blanket while setting up my bivy, or wrap up in it for extra warmth if I needed to repair something on my bike, or lend it to a friend, or whatever. In my insulated hydration pack I put the extra batteries and lights, long sleeve base layer, spare tube and flat kit, duct tape and more snacks. Snacks were loaded in my gas tank bag on my top tube and inside of my Cobrafist poagies. Snacks were basically hidden in every nook and cranny on the bike. 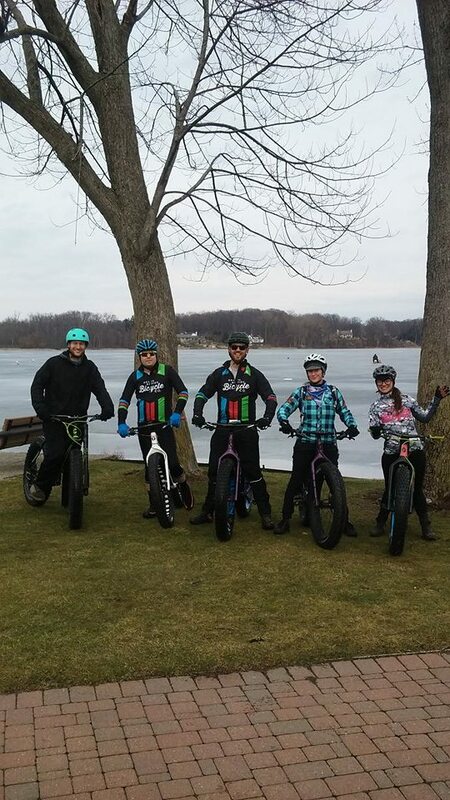 Fat bikers, skiers, and runners. All in one gymnasium. We went out to dinner after the racer's meeting with our friends from Surly and laughed about a bunch of things unrelated to the race, had a couple beers, and made our way across the parking lot back to our hotel. There was a Rocky marathon on TV and I was pretty convinced that it was a good omen. I made a few more piles of things, obsessively checked the weather to make sure it wasn’t going to change, and ate a couple more snacks. I had read a few race reports from previous years and I had memorized how far in between checkpoints, but I was really looking forward to discovering the unknown by myself. 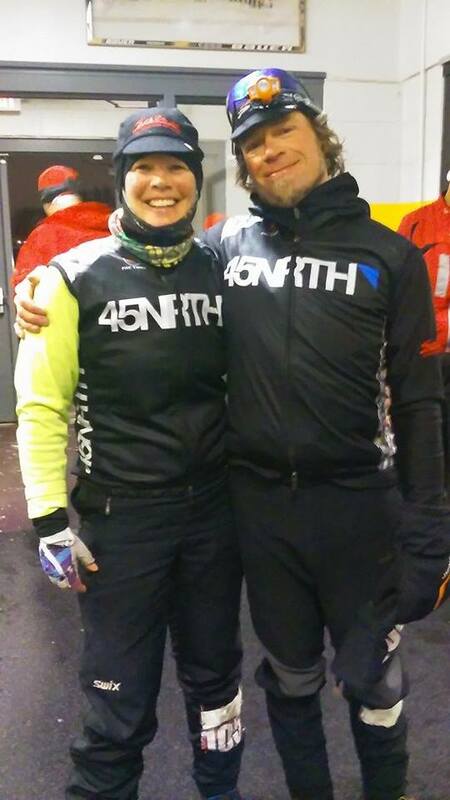 I'm so lucky to be on team 45NRTH with this lady. The first checkpoint, Gateway, came up pretty quickly and I reached back to check how much water I still had in my hydration pack: it felt pretty heavy and I knew there was still unfrozen water protected in my frame pack, so I just rang my bell, waved, and cheered as I rode past. Just another 30-some miles to the next checkpoint. That’s just another 30-some mile ride. I think one of the tricks to a long-distance ride or race is breaking it up in to portions. The first checkpoint was 36 miles in – that’s the Barry Roubaix. I’ve done the Barry Roubaix fat bike 36-mile category plenty of times. I’ve been able to finish with enough energy to keep partying and hanging out afterwards until 2 or 3 in the morning! The next checkpoint, Melgeorge’s, was 35 miles away from the first one. I still had enough water and food easily accessible for another Barry Roubaix, or so I thought, so I just kept rolling through Gateway. The course at that point was tolerable and although mushy in spots, it wasn’t that bad. I didn’t realize the next 35 miles would be incredibly different from the first portion and it took a little longer than I anticipated: mostly because of the hills. I ran out of water barely before the first checkpoint, and was so happy to have hit the frozen lake signaling Melgeorge’s existence just as I heard the gurgling from my empty hydration pack! Holy wah, that was cutting it close! 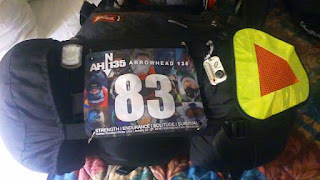 The funny thing about the Arrowhead 135 is that a few months beforehand I had been in Marquette, Michigan with the rest of the 45NRTH crew and Jay and Tracey had said “it’s not that hilly” regarding the course – I had also talked to a few friends who lived in the Midwest (where I live) and they had said “it’s really hilly.” I decided to worry about each hill when I got to it. The hills on the Arrowhead trail were a little steeper than I was used to and that the snow basically made the hills a whole different animal. On a lot of the hills, you could see a deep tire rut to the right and a man-made stairway to the left: the snow was almost too soft to climb on and a lot of the folks were walking them. 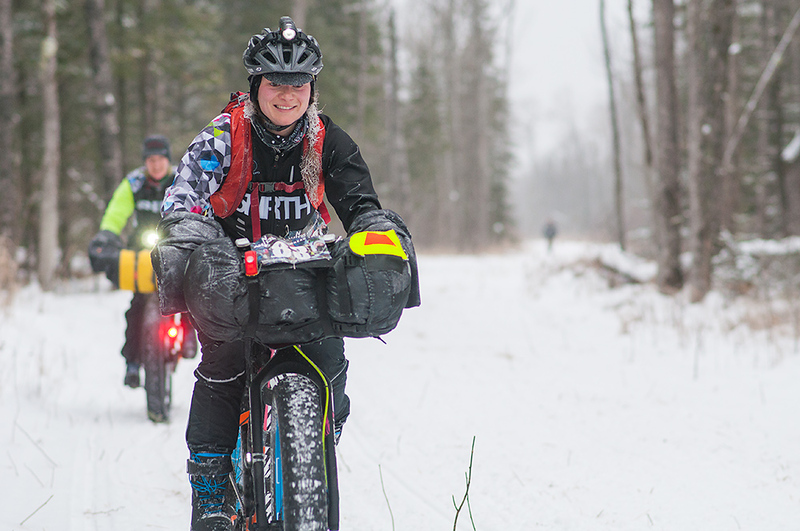 As typical with other fat bike races, the more people start to walk, the harder it gets to ride because of the foot prints. On a few of the climbs early on I started off trying to ride them. 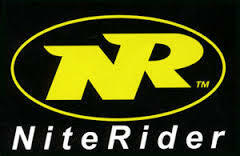 My legs burned and my rear wheel would frequently spin out. I gave in and decided to save some of my matches for later use (I knew it was hilliest in the mid-portion of the race) and to walk those hills. I got passed by a few riders while walking up these hills and felt like I was moving like a snail, but judging by all of the footprints on the climbs I figured I wasn't moving that much slower than the people ahead of me. By time I made it to Melgeorge’s I saw Tracey preparing leave and I was really surprised because I wasn’t expecting to see her once we left the first stretch of trail. I knew I had to make my transition time at that checkpoint as quick as I could because I wanted to stick close. I had decided before the race start that at Melgeorge’s I would stop to change in to some dry clothes before heading out into the night. 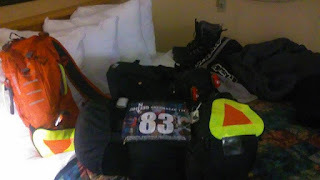 I wanted to change in to warmer gear, to have a fresh set of lights, to fill my stomach, and to head out with a fully-loaded Camelbak bladder and water bottle. I wanted to spend a little time warming up and taking care of myself, and I wanted to treat the next 40-miles of the race as a new ride. It became harder to treat it that way when I saw Tracey getting ready to head out. I wanted to just keep riding and to chase her: but I knew I needed a little bit of self-care before tackling the next leg of the race. So I ate two grilled cheeses, went to the bathroom twice, I changed from a short sleeve base-layer to a long-sleeve, put on fresh socks, grabbed some dry headwear, re-situated some snacks, laughed when I saw Tom and Scott wearing the fleece neck gaiters I made them, and went to put on my dry gloves, excited that I had been there for less than a half hour – only to realize I had packed two left-hand merino wool liners instead of a right and a left. Shoot!!! A really nice volunteer at Melgeorge’s saw my disappointment and asked politely if I wanted to wait for him to dry my wet pair. I almost got sucked in. 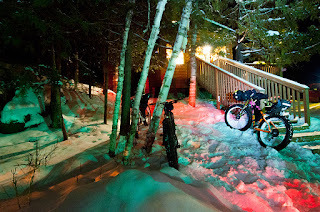 After a quick moment to contemplate the situation, I decided to wear both left gloves and to ride out in to the night looking like a goofball – two left-hand gloves made more sense to me than waiting 20 minutes for a proper pair to dry and I didn’t want to give up those 20-minutes to chase after Tracey. Besides, my 45NRTH merino wool liners didn’t have much padding on the palms and there wasn’t much difference between wearing the right and left glove, I told myself. 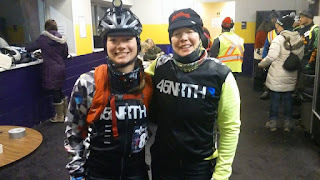 (After the adrenaline from the race wore off and I found myself in the hotel room at Fortune Bay Casino, my palms got whiney - they were complaining from being trapped in wet gloves for so long -I think I should have swapped for dry gloves a few more times throughout the race – whoops!) I rode off cheering and dinging my bell from Melgeorge’s, hoping to stay ahead of the women behind me and hoping to close the gap between Tracey and I. The gap between Tracey and I grew. 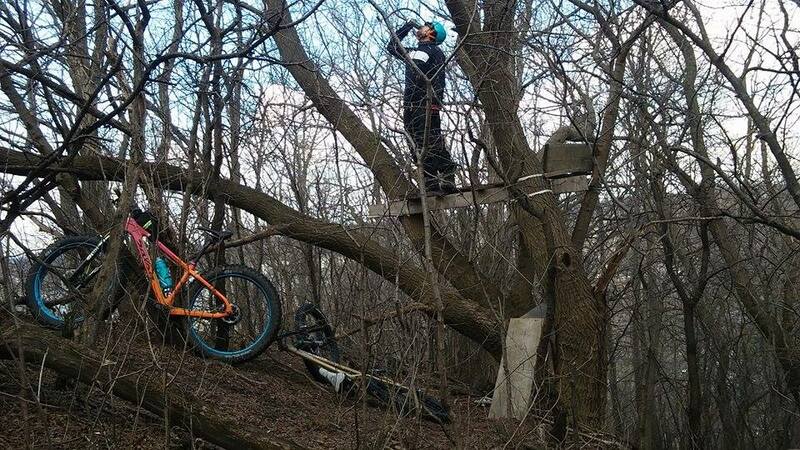 I can only imagine that every hill I walked up she managed to ride up. She’s magic like that. At one point, Christopher Tassava passed me on a climb, and I was both really excited to see him and a little bummed to see him. Chris and I have been internet friends for a while, and I wanted so badly to hang with him and to keep chatting as we rode, but he was moving faster up the climbs than I was and he eventually left me in his dust. I came upon a rider walking on the side of the trail and asked him if he was okay – it was Steve Cannon, who I’ve since learned is an endurance athlete tackling many other endurance feats (running around Lake Michigan, as an example). Steve’s pedal had completely exploded. Just this past summer, someone had helped me with a blown up pedal mid-race (Thanks, Sarah Temby!) and I made it a point to stop and to help Steve. I had some duct tape and thought maybe we could somehow rig a platform on to his spindle and we could make it work. Although the final product looked decent, it lasted approximately 37 seconds. When Steve caught up to me on the trail I was bummed for him but I was also really excited for me - I was getting tired out there and had started talking to myself and shaking my head to stay awake – finding someone out there to talk to was sort of awesome! Although I could pedal on the straightaways better because my pedals were intact, he caught me on the climbs because his long legs could walk faster uphill than my stubby ones could. We stopped at a few hilltops to eat snacks and to celebrate making it up another hill, and it made the time between Melgeorge’s and the Surly Checkpoint go quickly. Although there were a few mirages (I’ve never hallucinated so many igloos and teepees in my life) by time we finally saw the Surly Checkpoint and I heard Dan howling like a wolf, I thought only a few hours had passed! 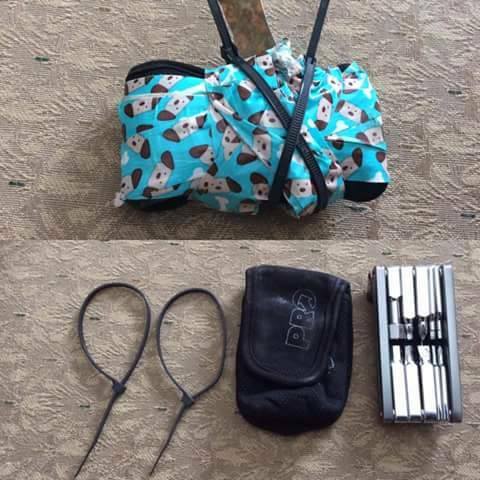 Someone posted this item they found on the side of the trail on facebook. WHY would Steve leave this piece of work behind?! Surly CP3!! Thanks for all the fun and encouragement! 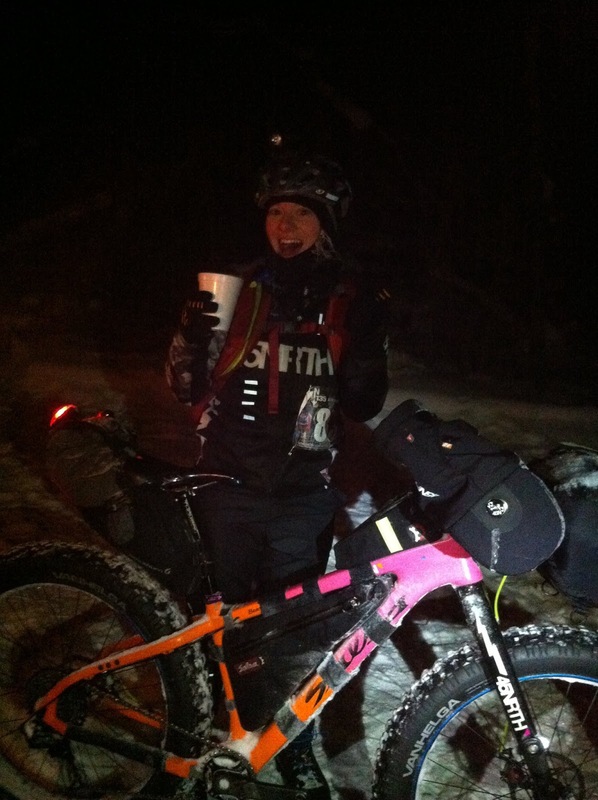 At the Surly Checkpoint, I knew I had to change my headlight. At Melgeorge’s I had put a really bright NiteRider 750 lumen light on my helmet and according to my math once we made it to the last checkpoint I had zero hours left to ride with it – it was a surprise that it had actually lasted all the way to there, considering I was four hours off from how late in the night/morning I had thought it was! I had used a battery operated 200 lumen light up until Melgeorge’s and had stored it away for the night wanting a brighter one to carry me through the eerie night. I laughed because I didn’t expect the 750 one to have lasted that long in the cold! 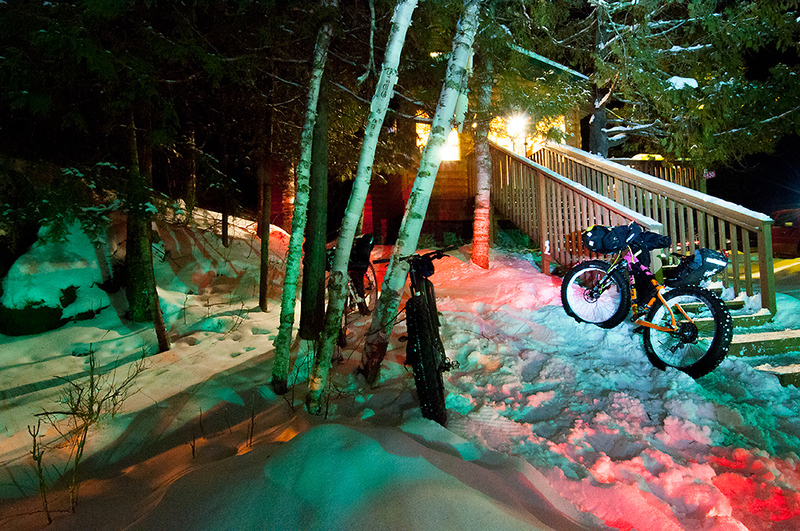 My chilly, fatigued hands tried twisting the top of the 200 lumen light off and I couldn’t do it. It was too tight and I was too much of a baby. I used my teeth and the top of the light came off, but it wasn’t the right part and the light bulb and shiny metallic cone that reflects the light stayed in-tact, taunting me. Dang it! Dan’s usually so used to helping me that I knew it was torture for him. The Surly folk also knew they couldn’t help me, so they started cheering for me and jumping up and down. Steve Cannon had gone inside of the teepee and I knew I was all on my own: so I started yelling at the light and bashing it against the log pile for the bonfire, trying to knock something loose and to try to magically fix it. FINALLY, the piece I needed popped loose and we cheered our brains out! I put new batteries in triumphantly and kept cheering as the top clicked in place. Yes! 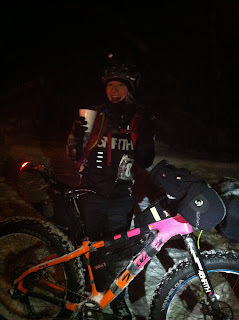 I chugged the rest of the hot coffee that they had poured for me and headed out in to the darkness towards the finish. Immediately after leaving the last checkpoint, I had to go to the bathroom. Dang it! Steve Cannon was close enough behind me to where I was worried it’d be awkward if he caught me with my pants down, so I hauled for a while until I couldn’t see lights behind me and stopped to go as quickly as I could. Luckily Steve didn’t catch me while I was peeing, but he caught me as I was clamoring back on to my bike. We had a laugh and started riding, about to climb the next hill. We hiked up it, knowing that it was the last of the climbs, and I wanted to stop so badly at the top of it and to take a picture – the view was beautiful! Tons of lights were sparkling down in the valley below and it was such a good feeling knowing that the rest of the course lay below us. Instead of whipping out my phone, I snickered at the top of Wakemup Hill and started careening down the side! 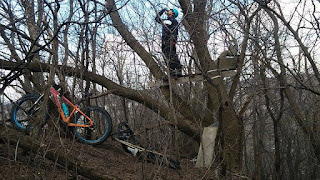 Seriously, the downhills on the Arrowhead trail were a blast – especially with my velcro-esque 45NRTH Vanhelga tires gripping and tracking the way! I couldn’t help but smile, knowing that there were less than 20 miles to go to the finish. That distance is literally less than riding to my favorite mountain bike trail and back home – I was so excited! I’d be to the end in no time! It was actually bittersweet once the last hill was over and I knew I was on the homestretch – after all the training, the riding, the worrying, the excitement, and all of the other emotions: my first Arrowhead 135 was nearly over. I had spent a lot of time wanting so badly to make it to this race, and despite how many fat bikers were ahead of me the biggest victory would be to finish it! I was really stoked to finish my first Arrowhead, to finish without mechanicals or without injuring myself, and I was especially stoked to finish behind Tracey Petervary! 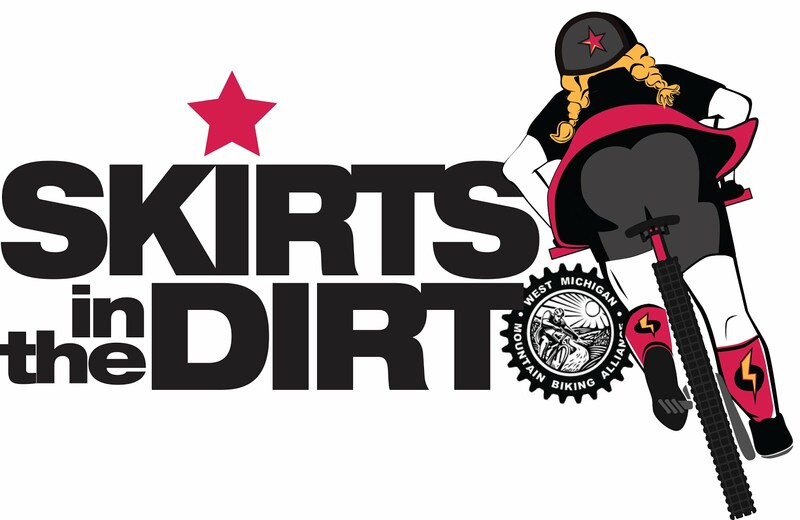 Dan had told me she was walking with her bike when he saw her at the Surly Checkpoint, and I don’t know if it was all in my head and that I had imagined it or if it were real – but I swear there were Dillinger tire tracks and Wolfgar prints growing fresher and fresher ahead of me! Shortly after passing Chris, I got hungry. I reached in to my Cobrafist Poagie and realized my snack supply in there was empty. I felt bad for passing Chris and for having to stop in his way so I started pedaling like mad to put the space between the two of us so I could stop and snag a snack without obstructing his way. By time I stopped and looked back to make sure there was enough space between us, I didn’t see him at all. “Woah.” I thought. “Where'd he go?” Those Dillinger/tiny Wolfgar prints were still appearing on the trail and I didn’t want to spend too much time worrying about what was behind me, so I grabbed the last of my snacks from the frame pack (marshmallows and yogurt covered raisins, obviously not my first choice but they’re there so I’ll eat them...), dumped them in my poagies and kept riding towards the end of the current corridor. Eventually, after a few of these never-ending corridors, I saw some orange temporary fencing. Pedal, pedal, pedal! The orange fencing kept going. What? Ugh. Longest. Corridor. Ever. There was a turn in the orange fencing and I was so stoked – except it led to more orange fencing. Finally, it led up another hill (ugh) and I saw an arch and a few people hanging out underneath it. Then I realized, “that’s the end!” Tracey was posing beneath the sign for photos and Mike “Kid” Riemer was with her. There was a bonfire, a few other folks, I could see the Fortune Bay Casino, and it seemed so surreal to be at the finish line!! I almost didn’t believe that I was there! The funny thing is that somewhere in the middle of the night I had made it up in my head that the finish line was this big elaborate loop around the main floor of the casino, through an elevator, and up to the top floor. I immediately started laughing at the finish line because I realized I was full of crap and that I had made that scenario up! I don’t even know how I got that in my head!!! I came through the finish line at 25 hours and 53 minutes after I had left the start – only 3 minutes behind first place female, Tracey Petervary, and 16th overall. Two left merino wool liners. After high-fiving Tracey and Jay at the finish line and congratulating them both on their wins, cheering on a few other finishers, and making my way inside, I found a very surprised and stoked Dan, who wasn’t expecting me back in that soon. I got the finisher’s trophy (it's awesome!!! 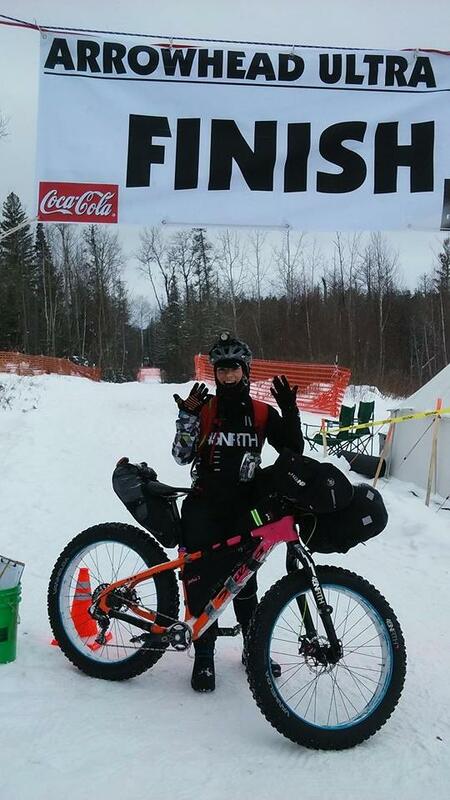 ), snagged a photo in front of the banner, and Dan took me to our room for a nap – nearly 26 hours earlier we had discussed what time we’d thought I would finish and that we would immediately start driving towards a friend’s house in Minneapolis. I was REALLY happy to have a bed beneath me within an hour of finishing and so, so happy that there was a refrigerator there to hold all the snacks that I had left in Dan’s care. 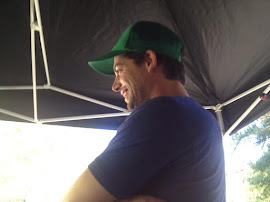 (I inquired about my cooler and didn’t learn until later that Dan had put wolf poop in it to take home to our friend Ted, which is both funny and disgusting – I will never use that cooler again.) Pulling really old sweaty and wet socks off of my feet is a feeling I wish upon no one, and the stinging shower afterwards was also a punishment that I didn’t expect. After getting out of the shower and feeling like I didn’t want to put clothes on for days, Dan told me that some friends were coming by our room to congratulate me – yay! I was really excited to see Scott and Tom and shoved snacks in my mouth as I got ready to welcome them at the door. There were a lot of hugs and high-fives once they found our room and we were all so excited to meet down at the finish line arches to see Kurt roll across the finish– he had bivied up with the crew he was riding with and would come through in a few hours. I crawled back beneath the covers, set my alarm, and had such a hard time sleeping because I was so excited to cheer for Kurt. Eventually I gave up on a nap and scoured the hotel for a balloon to congratulate him with at the finish line. I drank a few whisky & cokes while decorating his Fortune Bay balloon and waited for him. I was so stoked to have finished my first Arrowhead, super hooked with wanting to come back again, and a little sad that it was already over. I was also so excited to share this feeling with a friend who was also a rookie finisher! I can't wait to come back again! I will tell you: the Arrowhead trail did not disappoint! The woods were thick and dense, big clumps of snow hung to branches, the snow was beautiful, the people were amazing, and there were footprints spattered all along the trail (I think I even saw a spot where an owl caught a mouse beneath the snow – that’s so cool!) At night the woods got a little eerie, and although sometimes I got a little creeped out being by myself in the dark, I just rung my little handlebar bell and imagined all the scary animals running away, terrified of it. Ha! It’s all a mental game, right?! I still can’t believe it’s over. 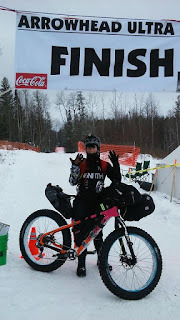 Thanks so much to Grand RapidsBicycle Company for encouraging me to chase my goals and to 45NRTH for sending me out in to the wilderness with warm and cozy boots, gloves, and poagies, and for making the best tires for the course. As always, a bazillion thanks to Dan for being my partner and mechanic and for believing I can do it, and to all my friends and family back home for being the best and rooting for me through the middle of the night. I don’t know how I got so lucky to deserve you all, but somehow I see you smile and it makes me want to keep pushing towards stuff like this. Gah! It feels good to be back home riding with friends. and gettin' into trouble with Dan around town. But for real, I can't wait to do it all again.